HFT presence on the FX market – UltraFX VPS – Moneywheel Research cPlc. FX market is considered slow compared to the equity exchanges. Especially from the retail FX trader perspective where real latency competition often exist only in a limited fashion. However if we analyse a no last look top of the book (TOB) prices on one of the Equinix LD4 located FX venue than we get an interesting picture. 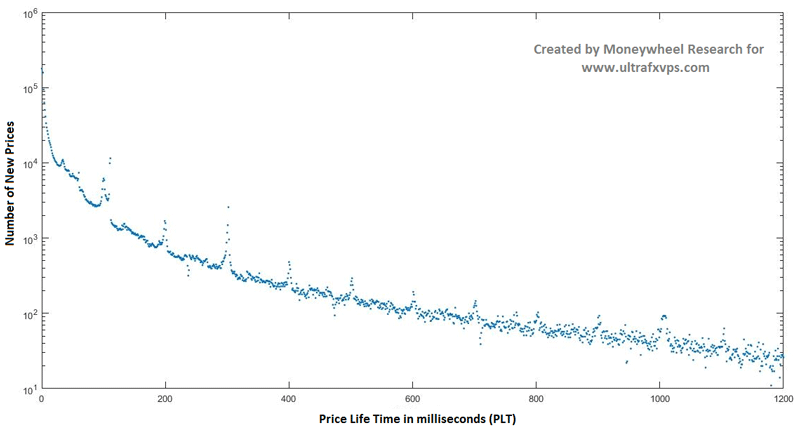 We have measured the EURUSD TOB price life times (PLT) of 7 days (UK time from 8 am to 5 pm). The number of changes were around 12 million for this period. On the graph below, the vertical axis shows the number of new prices and the horizontal axis shows the life time of prices in milliseconds. The Price Life Time is determined by the cancellation or by the arrival of a new price onto the TOB. 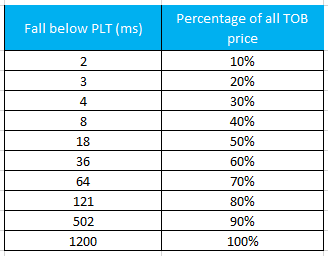 The table below shows how many percent from all TOB prices fall below certain PLT. Table explanation: 10% of the 12 million top of the book prices have a shorter life time than 2 milliseconds, 20% of the 12 million top of the book prices have a shorter life time than 3 milliseconds… and so on. The graph and the table above not only gives you insights of the well-known presence of high frequency algorithmic market making of liquidity providers, but also provides information to the liquidity taker algo traders about the latency task they face by choosing the technical setup for their algorithmic trading system. For example, if the algo trader runs his trading system from a Dublin located server, which has approximately a 13 ms roundtrip latency to London, to take the top of the book price on the Equinix LD4 located venue, then more than 40% of the prices will be as good as non-existent for his trading system! It will take approximately 6.5 ms until the price reaches his system and then another 6.5 ms to reach his order to the venue, but at this time more than 40% of the prices are not there anymore. It is absolutely clear the importance of colocation. However colocation is not the only important factor. Fast VPS or dedicated servers with a low latency network cross connected to the execution venue further increases the efficiency. For example, if the trader’s round trip latency is slower than 3 ms, then 20% of the TOB prices are out of reach. Every millisecond or microsecond counts. Cheap VPS service where speed is only a marginal factor could cause so much delays for a trading strategy that at end of the day it could cost the trader much more than a higher priced service where latency reduction is the first priority. The latency not only for higher frequency trading algos are important, but often for less frequently trading systems as well as soon orders need to be placed or modified in reaction to position or price changes. Let’s assume that a strategy which uses an hourly chart (hourly sample) gets into a position and a trailing stop gets activated on the trader’s server. In this case, it could be crucial how fast the trailing stop gets modified and placed on the execution venue’s server. Especially when the trailing distance is set relatively close to the current prices. Latency reduction is our first priority and clients from UltraFX VPS are often in and out of a position in a time when other trades only begin to react.